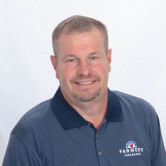 As your local Farmers® agent in Greenwood, AR, I help customers like you identify the insurance coverage that best fits your needs. This process is straightforward and personalized to help make you smarter about insurance. I have the knowledge and experience to help you better understand your coverage options--whether that's auto, home, renters, business insurance and more. Give me a call at (479) 252-6777 and I'll be happy to answer any questions you might have. As your local Farmers agent in Greenwood, I can help make you smarter about insurance.